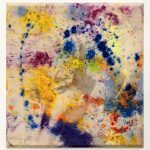 By folding, creasing, and ultimately draping his canvases, Sam Gilliam brought color abstraction closer to the viewer than any artist before him. 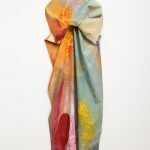 In 1962, when Sam Gilliam arrived in Washington, D.C., the leading avant garde presence was the Washington Color School—a group of artists working in the color field style. Gilliam, who had finished his MFA at the University of Louisville in Kentucky a year earlier, relocated to the nation’s capital to unite with Dorothy Butler, a recently hired reporter for the Washington Post and the woman he planned to marry. Though the Washington Color School painters got their name from the title of a 1965 show at the Washington Gallery of Modern Art, they had been active since the late ’50s. Characterized by bold stripes of saturated color, the canvases of the Washington Color Painters were equal parts vibrancy and precision. 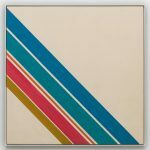 In 1962, however, Morris Louis, a leading figure of the group, died, and Kenneth Noland, though he remained an integral part of the Washington scene, had moved north. 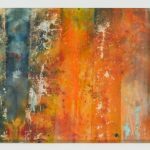 A younger generation of painters, with Gilliam chief among them, began to show at the influential Jefferson Place Gallery, reshaping the visual art of the city. Gilliam, who had set up a studio in a carriage house above a garage, had his first solo show in 1963. There, he met Thomas “Tom” Downing, a student of Noland’s, who along with Louis, Noland, Howard Mehring, and Gene Davis would represent the Washington Color Painters in Clement Greenberg’s seminal 1964 traveling exhibition “Post-Painterly Abstraction.” Gilliam recognized Downing from an article he saw in the paper and asked him what he thought of his show. Meeting Downing would prove to be a major turning point in Gilliam’s direction as a painter. Downing teased Gilliam, who was painting figurative art inspired in part by the California School at the time, saying that his work gave the impression that Gilliam was scared to paint. Gilliam, charged by Downing’s advice that he should paint “real” paintings, cast figuration aside. In the following years, as Gilliam became more closely aligned with the Washington Color Painters, his work became more reflective of their style. 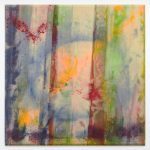 Using the Magna acrylic resin paints popular among the group, Gilliam created canvases washed with monochromatic fields of color divided by diagonal stripes and triangular forms. Though they were responses to the hard-edge geometric paintings of Downing and Noland and the strict tenets of Color Field painting, Gilliam’s works differentiate themselves with their subtle blending of colors and softer, lyrical sensibility. The 2013 exhibition “Hard-Edge Paintings 1963–1966,” his first with Los Angeles-based David Kordansky Gallery, put works from this era of the artist’s career on view. The show, which was curated by contemporary artist Rashid Johnson, served as a reintroduction of this series to the greater art world. Works such as Blue Let (1965), a canvas washed with a Pan Am-esque blue and a myriad of multi-hued stripes, or Helles (1965), an off-white canvas spangled with colored stripes of staggered thickness, find Gilliam working within a paradigm of material and color that would serve as a jumping-off point for his subsequent work. After the stripe paintings, Gilliam began experimenting with manipulating the canvas—folding and creasing it—before the paint could dry. Taking it off the stretcher, Gilliam would work his paint into the canvas on the floor, allowing pigment to pool in the canvas’ folds and thin at its creases. Referred to as Beveled-edge paintings or Slice paintings, these works, which Gilliam would stretch on a beveled canvas after the paint had soaked in, pushed past the boundaries of Noland’s pour techniques. In a video interview with the Smithsonian American Art Museum, Gilliam describes Light Fan (1966), an early painting from this period: “Light Fan is…kind of a color architecture. The color is put on chromatically; there’s a dark color, there’s a green color, there’s an ochre color, etc., that goes across to have a flow.” Says Gilliam, while closing his eyes, “Even though it was gestural, even though it had structural moments, it became unified in terms of the wetness of the paint. Light Fan was very significant because it was the springboard to real sculpture—to real sculptured painting.” Where color field painting took color as its central subject, Gilliam’s paintings of the late ’60s examined the sculptural qualities of the canvas, color, and paint itself. If Light Fan was “color architecture,” the series of paintings Gilliam unveiled at a 1969 exhibition at the Corcoran Gallery of Art questioned the architecture of a painting in general. Gilliam was asked by friend and curator Walter Hopps to show alongside fellow D.C. artists Rockne Krebs and Ed McGowin in a show appropriately titled “Gilliam, Krebs, McGowin.” Hopps, who was the newly appointed director of the Corcoran, created gallery spaces with 20-foot ceilings. Gilliam was assigned the upper floor of the atrium—a 30-by-60-foot space that Gilliam would need to paint bigger paintings in order to fill. It was while trying to hang the painting Niagara for the show in his studio that Gilliam happened upon what would become his signature. One side of the canvas drooped off the wall and onto the floor. Gilliam began draping his canvases, allowing them to hang, sag, and fold, Effectively turning two-dimensional paintings into three-dimensional objects, he eliminated the frame, the formal geometry, and changed his paintings’ relationship to the gallery wall. With no literal precedent in the art-historical canon, Gilliam’s drape paintings seem akin instead to the marble-etched folds of the vestments, which adorn the Three Goddesses of the Parthenon’s east pediment, or floor-skimming window treatments. They also present the viewer with a familiar material reality, an unusual feat for abstract art, which casual viewers, as has been incessantly lampooned since the ’50s, so often find alienating. The 1969 show at the Corcoran was met with high praise. Paul Richard, the Washington’s art critic at the time, described it as “enormously important.” D.C. art critic Ben Forgey, when conducting an interview with Gilliam in 1989, said, “I’ll never forget, and I’m sure many people will never forget, the drape canvases the first time we saw them in the Corcoran.” In 2005 the Corcoran gave Gilliam a show of his own, a full retrospective. 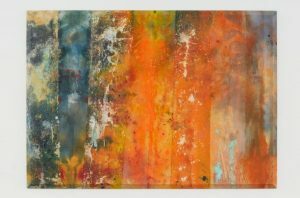 “Green April,” Kordansky’s second exhibition of Gilliam’s work, which closed this past July, focused on Gilliam’s beveled-edge and drape paintings. The majority of the pieces in the show had never been exhibited before. Green April (1969), the monumental beveled-edge piece from which the show gets its name, is over 20 feet of subtle, luminous gradations of seafoams and aquas, which bring to mind a marine fantasy or crinkled cellophane. Green April is described in the gallery’s release as sharing both the panoramic scope and ethereal luminosity of Monet’s Water Lilies. Crystal, a 1973 drape painting, has a brighter palette, with a similar seafoam alongside oranges, yellows, reds, and pinks. It hangs closer to the wall than some of Gilliam’s more sprawling hammock-like drape paintings. The piece bears a mesmerizing talismanic quality, which could be due in part to its name or to the fact that it resembles an enormous cloak. Existing outside of the literal and figurative framework of painting, Crystal seems to exist more freely within a shared space with the viewer. Gilliam, who is in his 80s now, was born in Tupelo, Mississippi—the birthplace of Elvis. He moved with his parents and seven siblings to Louisville during childhood. There he took to drawing early and decided he wanted to be a cartoonist. He grew up near a fairground where there was a circus, which he often attended—an influence perhaps on some of his tent-like drape paintings. At the University of Louisville, where he received his bachelor’s degree, he studied art and worked as a fellowship student at the library and art library. There he immersed himself in the books that professors used to compile their lectures. After college, he joined the ROTC and was stationed in Japan—a woodcut studio near his base, galleries, and art stores kept him busy. During graduate school, one of his professors, Carl Crodel, who was from Munich, claimed to know Paul Klee—a major influence on Gilliam—and thought Miró, who it is said was the first to use a paint pouring technique, was the last important artist. With Downing, Gilliam frequently took the bus to New York to see art shows. In fact, every interview with Gilliam emphasizes the importance of the museum or gallery space, to the point that it seems that looking at art is as central to Gilliam’s practice as painting. After the revelation of his drape paintings, Gilliam was featured in the American pavilion at the 1972 Venice Biennale. The following year, he made Autumn Surf, a drape made of 150 yards of 15-foot-wide polypropylene for the San Francisco Museum. In 1975, Gilliam installed a series of drape paintings titled Seahorses on the side of the Philadelphia Museum of Art as part of a program sponsored by The United States General Services Administration. The canvases—two of which were 30 by 90 feet, the other four 30 by 60 feet, were attached to bronze rings, which adorn the museum’s building. An installation at the Brooklyn Museum was held the following summer. During the ’80s and ’90s, Gilliam took quite a few commissions for installations or public art. A primarily-colored fan like polychromed aluminum and steel hanging sculpture was installed in LaGuardia Airport in 1996. He built a piece above the tracks of the Davis Square Subway in Cambridge, Mass., and created installations in Germany, Chile, and Korea. While Gilliam has been exhibiting regularly in D.C. for the past few decades, his work is still not as well known and appreciated as it ought to be. Recent shows with Kordansky and acquisitions by MoMA and the Met, however, have shined a well-deserved spotlight on multiple periods of the artist’s work.